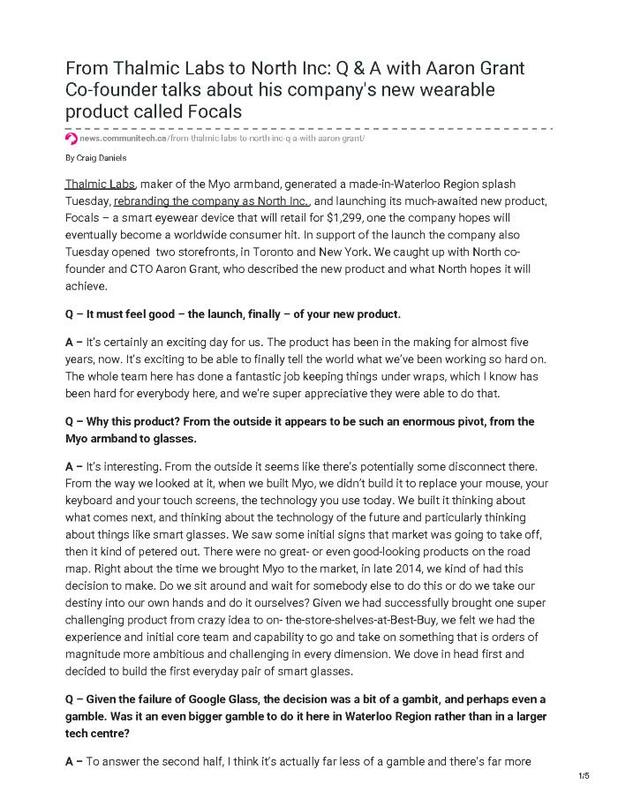 Thalmic Labs, maker of the Myo armband, generated a made-in-Waterloo Region splash Tuesday, rebranding the company as North Inc., and launching its much-awaited new product, Focals – a smart eyewear device that will retail for $1,299, one the company hopes will eventually become a worldwide consumer hit. In support of the launch the company also Tuesday opened two storefronts, in Toronto and New York. We caught up with North co-founder and CTO Aaron Grant, who described the new product and what North hopes it will achieve. Q – What can the eyewear device do? A – There are four key areas. First, communication – it’s a quick way to stay in touch. We built a smart reply engine and it lets you fire off a reply quickly. Or you can use voice to text. The next feature we call ‘Go,’ finding places around you that you want to go to. We have a partnership with Uber, so it lets you order an Uber, or it can give you turn-by-turn walking directions. Then we have a bunch of features we call Day-to-Day, which is calendar notifications, weather and utility things. And then the last one is Amazon Alexa. We’ve worked closely with the team at Amazon to build an Alexa experience for smart glasses – great visuals that the Alexa team has built for us for this product.